It was so much easier with the ' RR ' badge on the front and the ' winged lady ' on the bonnet. Great photographs, it was good to see those WW1 workhorses back on British roads still providing a service. Would they have been re registered or is it [im]posible they might turn up in some in pics when in France? It's ironic, given these photos, but war-surplus lorries caused major damage to the railways. Before WW1, the railways were still the way most farmers got their produce to more distant markets and if it meant a trip or two with a horse and cart to the nearest station then so be it. Bear in mind, some stations could be a very long way from their namesakes. Dent station is something like seven miles from Dent village, for example. The number of lorries used by the forces meant that they'd had to train thousands of men to drive and that meant these surplus lotties could be bought cheaply and have a ready supply of drivers. They weren't as regulated, could set their own charges and pick up the produce at the farm gate and, once loaded, the produce could be delivered in a fair radius of the farm more quickly than the railways could. Almost overnight, wandering branch lines that had always been on the margins of profitability made a loss and they couldn't recover. 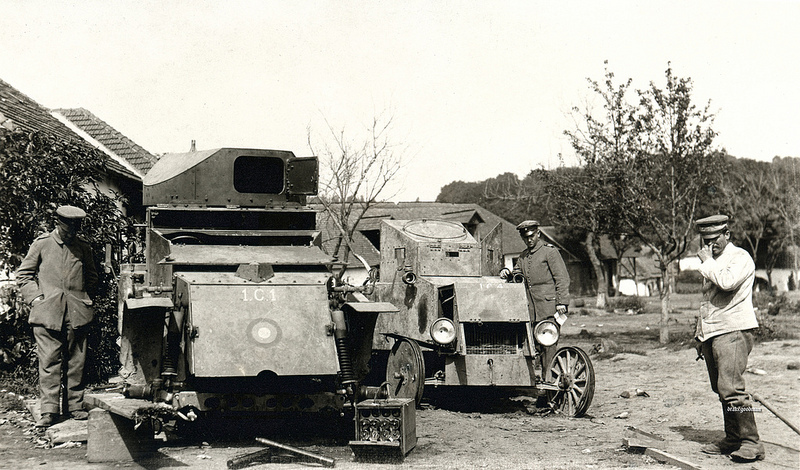 German soldiers examine a hastily abandoned Russian field workshop where two examples of imported armoured cars were in the process of being repaired, a British Lanchester and an American Ford. The Russian Army received 22 Lanchesters in December 1915. 19 of them were later rearmed with 37-mm naval Hotchkiss gun instead of a .303 Vickers machinegun. 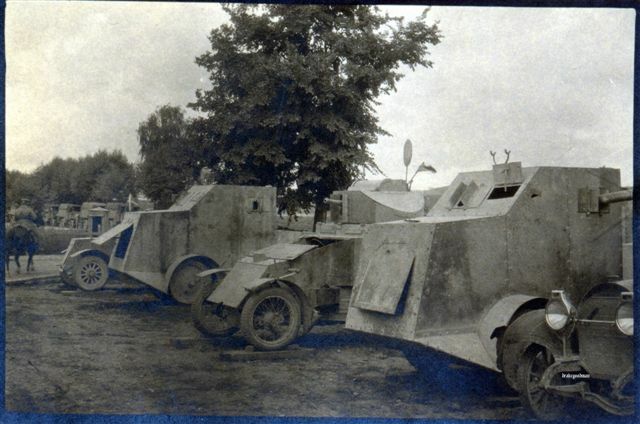 Photographed in a Russian depot at Tarnopol ( Ukraine ), a mixture of Russian armoured cars, from left to right, a Poplavko-Jeffery, a Lanchester and another Poplavko-Jeffery. The large Poplavko-Jeffery's, built around 1916, were basically an armoured body dropped onto a American built Jeffery truck chassis.The Jeffery truck was a 4x4 chassis which gave it good cross country mobility and was ideal for a conversion to an Armoured Car. 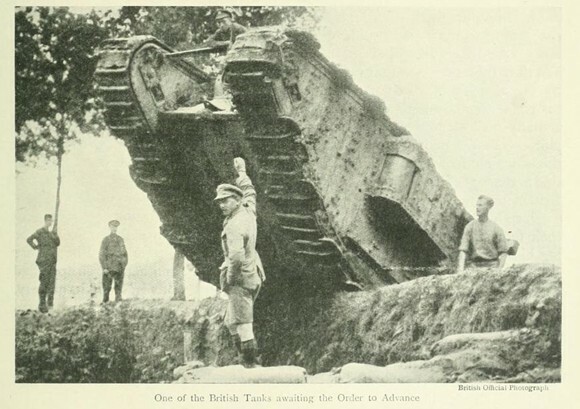 About 30 of these vehicles were produced and they entered service sometime in 1917. 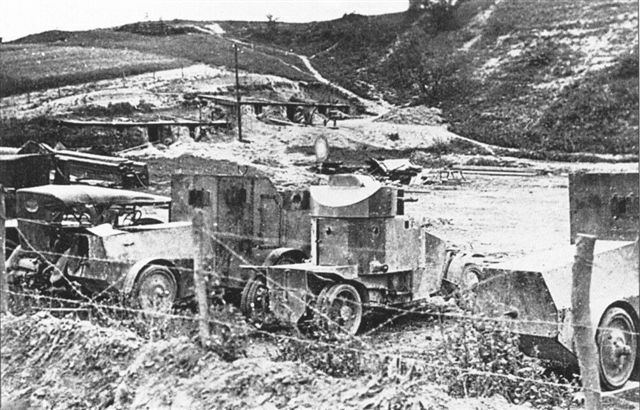 In the other photograph, probably taken by the Germans, we see the same group of armoured cars including the Lanchester, after Tarnopol had been taken by the Germans. 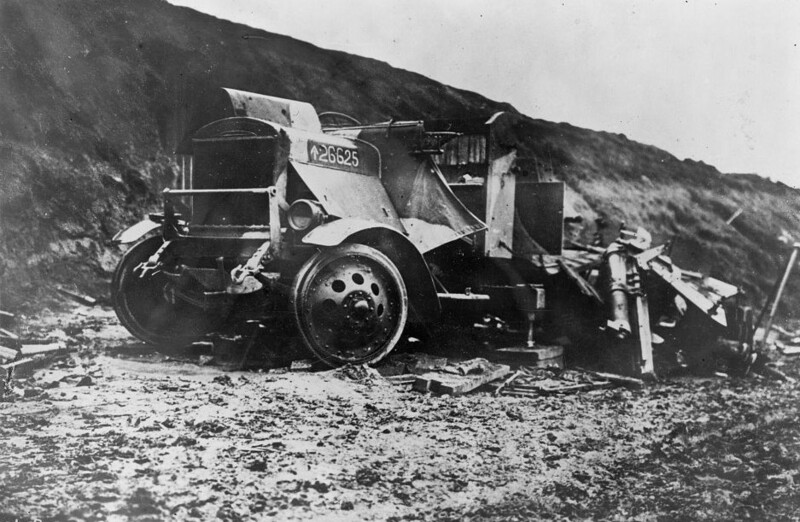 I am sure many of those ex-Army lorries used on the Western Front, appear in WW1 photos. 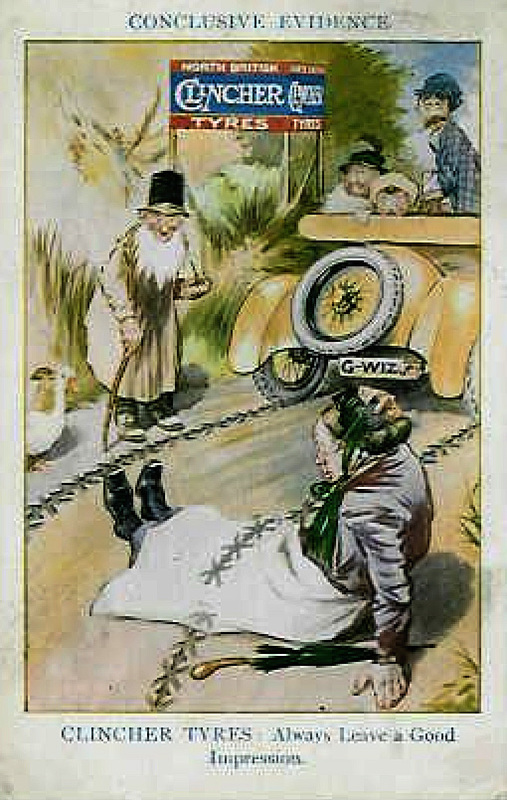 With the exception of the first lot of impressed or subsidy lorries those which served overseas would not have had licence plates such as these. When ex WD trucks were sold off they were issued new registrations. The LU licence on the AEC is a London registration from 1919. The other one NA7048 is from Manchester but the run of numbers starts from 1913 and ends in 1919 but probably a 1919 registration. In post 660? Yes they are. I have seen a pic somewhere of a vehicle with what we probably refer to as Sheeps Foot. They look like suction pads on the tyre tread. Talking of treads, have you seen the inner n's on the photo bottom left post#659? Yes, I had noticed that. In that post, are shown the rear of 2 different Lanchester's and both have a different tread on the rear inner left side tyre. 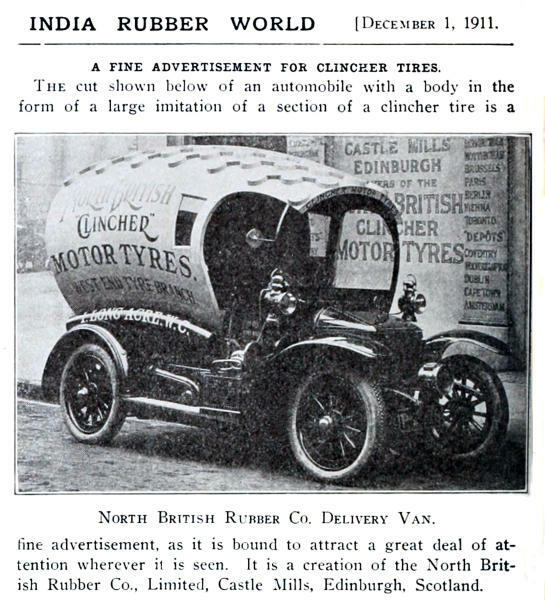 What a great piece of very early motor vehicle related advertising ( 1911 ), and way ahead of its time, when considering the specially constructed advertising vehicles often used today to promote various products. 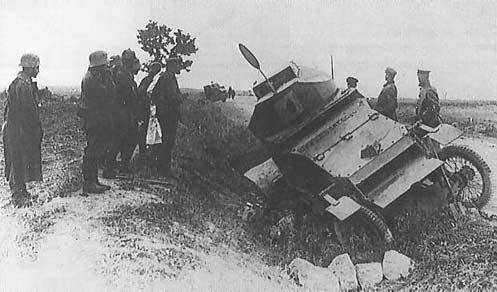 A badly damaged British 13 pdr. 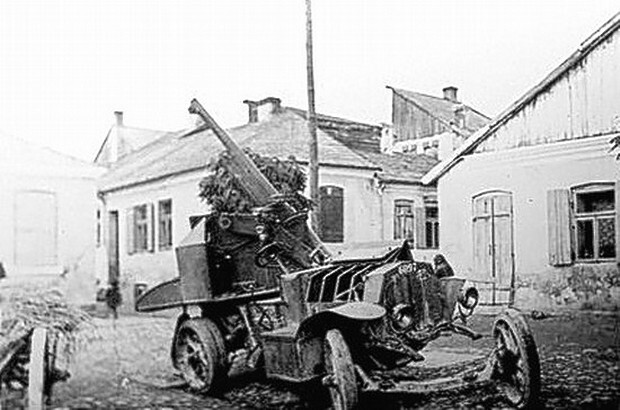 Anti-Aircraft Gun mounted on a Thornycroft Lorry, the cause of the damage could have been enemy action, a malfunction of the gun or the munition, or the gun having been deliberately disabled rather than have it fall into enemy hands. I wish we had a shot from the rear of this lorry as I find this image very intriguing. The mount has broken at the traversing pivot where it meets the pedestal (see the image of the derelict lorry in Post 553) but the piece doesn't look as if it's significantly damaged. The front jacks are still set and the scotches under the front wheel have barely been disturbed. You can't see the rear wheel - I think the gun is lying on it - and the platform looks fairly level but the front corner is bent down. Unsurprisingly if the gun's fallen, the side-board of the platform is smashed. The door to the front ammunition locker is open but not damaged. It doesn't look, as the caption suggests, destroyed. Damaged, yes, but not, I think, a direct hit because there's no damage from either shrapnel or shell fragments. I could even imagine a failure of the pivot causing this, although the barrel was not elevated when the accident occurred so it wasn't firing at the time. This is a very curious picture with a misleading caption! When I first saw this photograph, I wondered if the damage had been caused by a malfunctioning shell exploding in the gun, or if the gun had been deliberately destroyed rather than have it fall into enemy hands ? I shall edit the post, until we perhaps know more regarding the possible cause of the damage. A badly damaged French 75 mm ' Auto-Canone ' Anti-Aircraft Gun. I don't think it's a misfire or premature because the piece itself looks OK but that's a guess. There's also the fact that the barrel is pretty much in the travelling position so I doubt if the gun was firing when this happened. The lorry was parked up and the gun was ready for action so something unexpected happened to break the pivot. If this was caused by a shell landing nearby I would expect some evidence of shrapnel or shell fragments but there are none. Was it a failure due to a material fault? Were they working on the gun and dropped it? I have to say that I wouldn't expect the piece to have landed where it is, the right way up. That would be unlikely so I wonder whether this is some time after the event and the photo actually shows part of the recovery process? When 24th AAS was due to be evacuated from Gallipoli an RE arrived with explosives to destroy the gun if it could not be retrieved. When field guns were abandoned, they removed the breech-block and dial sights to disable them so this doesn't look like that. I don't know anything in detail about the design of the HA mounts much beyond the Mk 1 for the 6-cwt needed two buffers while the Mk 2 improved elevation and only needed one buffer. The Mk 3 mount for the 9-cwt was the Mk 2 modified to take the heavier piece but proved flimsy and was replaced by the Mk 4, which was beefed up. I don't know whether any Mk 3s made it into service but the pivot is clearly a weak point in the whole assembly in all Marks. The auto-canon appears to have a large bearing surface to absorb the stresses, far larger than any British HA mount as far as i can see. The auto-canon is another puzzle. The gun is elevated, in a position to fire, but the jacks are up and the steering wheel is not folded down. I think this is the first photo of an auto-canon I've seen that shows the carriage traversed to one extreme and, if you know what to look for, you can clearly see that the driver's seat is facing backwards. Again, I don't think this is damage due to enemy action nor do I think it's badly damaged. If you look at the complete spring on the driver's side it's a fully-elliptical leaf type. On the other side only the upper potion of the spring is visible and the axle is slewed by pivoting around the spring attachment on the other side. This looks more like a broken spring to me, with the broken portion removed for repair or replacement and the slewed axle would be to make access easier. you can clearly see that the driver's seat is facing backwards. 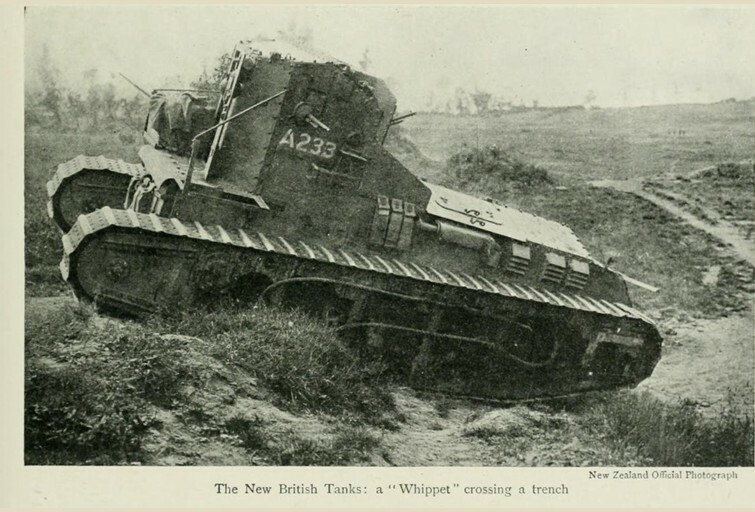 As you say, the driver's seat is in the completely opposite position to where they would be in the driving position, and the gun itself looks intact, the damage to the front of the De Dion Buton vehicle could have been caused by a road accident, enemy action or just sheer wear and tear on the parts. You wouldn't want to be the man on the top of tank! Least ways, not as that tank comes thundering down, hopefully by then he is back in the cab.